I love showcasing great nonfiction books that make a difference in helping others. Party With a Plan is such a book. It highlights a proven, practical way to drink alcohol and lower your risk for problems. Scroll down to read my interview with the author who I found to be amiable and knowledgeable. At one point we discussed how alcohol is viewed in the Italian culture. He wrote an interesting guest post for me which I posted on Essentially Italian. Finally! Here is a proven, practical way to drink alcohol and lower your risk for problems. Up until now, there have been two primary messages when it comes to drinking alcohol. One is “just say no,” which for the majority of the population is not an option. The other is to “drink responsibly.” But what does that mean? If you ask five random people to define responsible drinking, you will most likely get five completely different answers. This invalidates the term because it can be defined in so many different ways. Party with a Plan® gives a concise and research based formula that teaches people how to drink and lower their risk of negative consequences. It’s like creating a speed limit for drinking. If you stick to the speed limit, your chance of problems is minimal. However, the more you go over the speed limit, and the more often you go over the speed limit, the more you put yourself and others at risk. This book is long overdue! Please help me welcome Randy Haveson, author and counselor, who has taken time to answer some of my questions. LCR: Describe your book in 20 words or less. RH: I teach people how to drink alcohol and lower their risk for problems. LCR: What were the challenges in writing a book with this topic? RH: Making sure it wasn’t the “same old” alcohol education program. I didn’t want to use scare tactics or finger wagging. I wanted straight talk with solid, supported information. LCR: How did you develop the program that is featured in Party with a Plan? RH: I was working as a counselor on a college campus and I realized the alcohol education programs that were available were not effective. I wanted to create something that students would actually listen to and learn from. LCR: How has Party with a Plan made a difference in the field of alcohol addiction and recovery? RH: Actually, the book is used primarily in the alcohol education and prevention field and it has made a huge impact because it is a skills based program that draws a solid boundary between low-risk and high-risk drinking. It is intended for those who have not crossed the line into addiction. For people who are in recovery, the only option is abstinence so this book would not be appropriate for them. LCR: How can college students use this book? RH: By using it as a guide to help them make low-risk choices with alcohol. It will also give them the tools they need to identify if they have a drinking problem. The book sets up a challenge that if you are not able to stick to the low-risk guidelines in the book over a consistent period of time, most likely the person has an alcohol problem. I also include a section for parents that addresses the issue of talking to your child about alcohol and other drugs before they go to college. LCR: How can businesses or organizations use this book? RH: In addition to the college edition, there is a women’s edition and a generic edition for anyone who chooses to drink. My next project is going to be Party with a Plan-The Business Edition. The thought is that businesses can incorporate the Party with a Plan® model as their policy on consuming alcohol on company time or at company events. 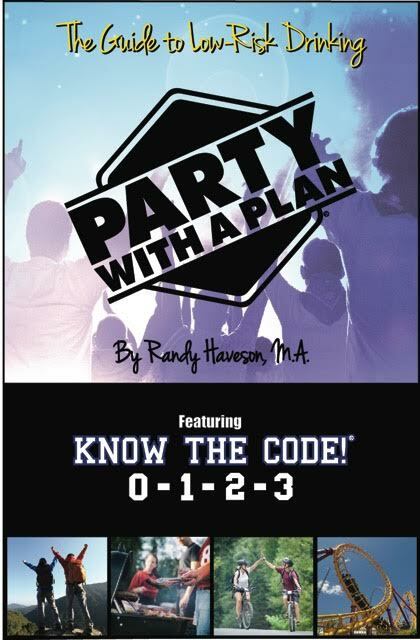 Until then, the generic Party with a Plan book will be useful for anyone over 21 who chooses to drink. LCR: Any touching experiences you can share about your mission? RH: Yes, there are many. As I mentioned earlier, I want to do a Business edition, a Holiday edition, and maybe even a Military edition. I am also working on a video project called “How to Raise a Drug Free Child.” I’m hoping to have the video available on my website by next month. And I’ve been asked to do a video for parents with kids in college that addresses how to talk to them about alcohol and other drugs when they go to college. LCR: Thank you so much, Randy, for telling us more about your mission and your practical program. Randy Haveson knows addiction. As an alcoholic in long-term recovery (May, 1984), he has dedicated his life to helping others make more empowered choices in their lives. He is a 25 year veteran in the substance abuse field with extensive experience as a counselor, Director of Health & Alcohol Education at highly accredited universities, and speaker on over 100 campuses, speaking about harm reduction, self-esteem, leadership, and supporting students in recovery. I'd like to win because this would make a great gift for my brother in law.